This set of two pretty lace panels for decorative pillows were designed in 1916 by Ethel Herrick Stetson. Spring Crown has spade and scepter motifs in in the center and border. Spring Wreath is smaller, with ﬁligree around the edges. This design shows oﬀ how ﬁlet crochet adapts wonderfully to pictorial representations. Originally written by an unknown designer in 1927 for the back of a chair, Two Peacocks Lace would make a lovely lace curtain or wall hanging for today’s home. Originally designed as a protective, decorative cover for the back of a chair, this dragon design would make a wonderful lace curtain for today’s home. Originally designed by Mrs. G.
You can crochet this bucolic scene to use as a wall hanging, pillow cover, or doily. Featuring a buck and doe in the forest, it was designed in 1917 by Eleanor Koontz. The entwined ﬂower and leaf border can be adapted to use as an edging in other projects. Use this simple but elegant tulip panel as shown for an insert or insertion in a bedspread, or use it at the ends of a table runner and add a simple edging. 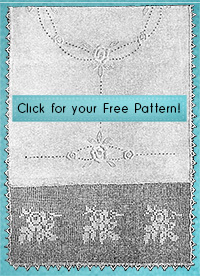 The pattern will also make a nice wall hanging or pillow cover. The original pattern was designed by Mrs. This detailed design of the Great Seal of the United States is suitable for a glass door, a short window-curtain, a cushion-cover, center of bedspread, and more. It was created by Mary Card as part of a 1918 series honoring allies of the Great War.